Nancy Grundahl: Bio & Choral Music | Santa Barbara Music Publishing, Inc.
Nancy Grundahl (b. 1946) is the conductor of three choirs in the Minneapolis area: The Angelica Cantanti Concert Choir (a youth choir), the Riverside Singers of Augsburg College (a women's choir), and the Mayflower Church Adult Choir where she also serves as the Director of Music. Many of her compositions and arrangements for these SSA and SATB choirs have been published. Her work with choirs draws upon her experience as a solo singer and voice teacher. She received vocal performance degrees from St. Olaf College and the University of Minnesota, and as a soprano soloist appears in recitals, concerts and oratorios throughout the area. She is active as a vocal adjudicator and clinician and as a guest conductor for state and regional choral festivals. 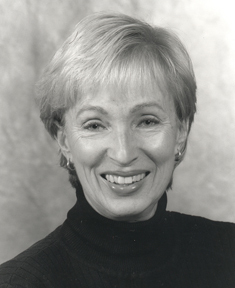 Nancy Grundahl has 5 titles published with Santa Barbara.